So, you want a flat belly workout that doesn't take a lot of time. Check out these Pilates exercises that you can do in 5-10 minutes a day to achieve that flat belly you've always wanted. I have put together just a bit over 10 flat stomach exercises in this video that you can do daily, or even every other day for best results. Watch it now and often to get maximum benefit from the cueing and pace of the workout. As a Pilates instructor I get the question all the time, "What is the best flat belly workout?" I have an easy time with that question because the focus with Pilates exercises is on creating more space in the body by flattening and deepening the lower abdomen and pelvic floor muscles. 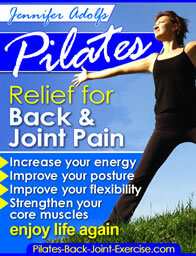 Pilates is different than regular crunches and other stomach exercises you may have done in the past. It works the deeper transverse abdominals that creates the flat effect. If you see the abdomen puckering when you are doing your abdominal exercises you are not doing them correctly. My Pilates Core Ball Workout DVD here has over 30 minutes of ball exercises designed for a women's body and needs. As an instructor I hope to help the student visualize and then achieve this flattening effect while they are doing their flat stomach exercises. I hope you can feel this flattening and deepening as you go through this Pilates exercise workout with me. Do the best you can with the exercises, remember you can do more or less repetitions based on the quality of your form and your health condition. You can always add more repetitions as you go, so ere on the low side to begin with so you can get through these deep abdomen exercises without feeling soreness and pain afterwards. Take some time to browse through my site and find out the many ways that Pilates exercises can help you develop both flatter abs and more strength and support in your back and joints. And...check out this new page I just put together for more stomach exercises for women. Leave flat belly workout and get started today with my Pilates ebook that has over 60 pictures of these and more Pilates flat belly exercises.